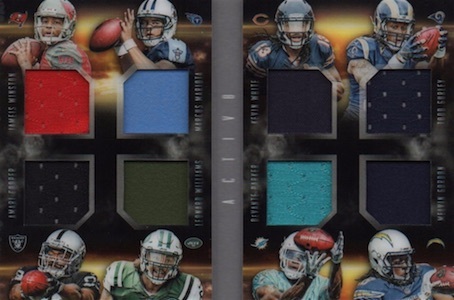 Once again offering a good mix of booklet cards, 2015 Panini Playbook Football returns with a high-end look at the NFL. Each box promises one booklet base card, one autograph or memorabilia booklet and one additional hit. 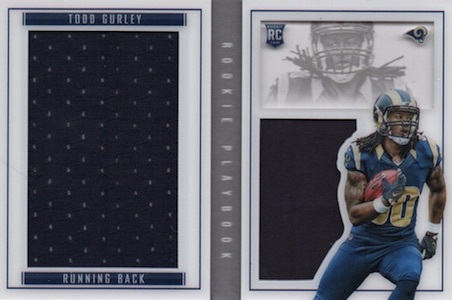 Mixing things up a little, the 2015 Panini Playbook Football base cards are actually all booklets. 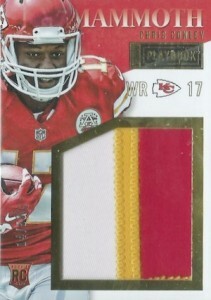 In addition to the main card, there are Gold, Platinum, Green and Red (1/1) parallels. 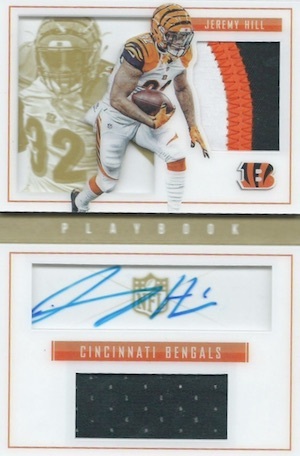 Rookie Booklet Signatures feature an updated design that includes multiple patches and an autograph. Additional options are available with NFL Shied (1/1), Drawn Plays (1/1) and Autographed Printing Plates (1/1) parallels. Split Six Signatures combines multiple signatures on a booklet card with a print run of 25 or less. Among the many memorabilia cards, Mammoth Materials are one of the few that aren't booklets. 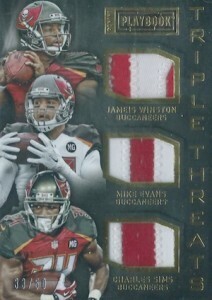 The jumbo patch cards also have NFL Shield (1/1) parallels. Armory booklets include six relic pieces while Down & Dirty booklets work with game-worn gear swatches that have seen a good deal of action. Both are numbered to 25 or less. 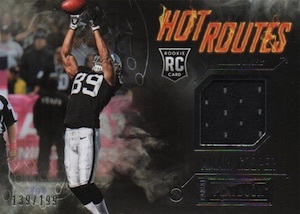 Closing out 2015 Panini Playbook Football, Rookie Booklet Complete Logo features the entire logo patch for key NFL rookies from the NFL Premiere. 41 cards. Serial numbered #/199. Some base subjects not found in parallels. View the full spreadsheet for specific print runs. 1 card. Serial numbered #/199. 25 cards. Serial numbered #/199. Any word on a checklist for this product? We are less than a week away. Al Hathaway � Nothing yet. Lately, Panini has not been providing them until the day before the release. Why do you suppose they wait til the last minute to release checklists? Nick � Not sure. They know collectors want the checklist as soon as possible but I guess they don’t feel that waiting until a day or two before impacts the overall interest. Bought into a 2015 Playbook 15x box case break two days ago…… Won the Atlanta Falcons for a whopping .06 cents. I’m sure that will never happen again. What did I get. Three books of Tevin Coleman, one was auto book, second was a duel three color patch, third a duel single color patch. The fourth and final card was a three player patch, three colors on each patch. I’ll never be that lucky again…… I’m pumped to get them in the mail next week. WOW!!!!! 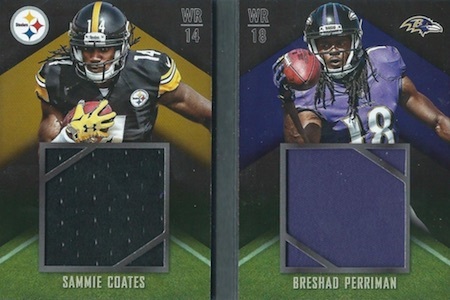 LOL I can’t even find those cheap patch cards of Sims, Latimer, and Williams from Panini’s own box break on their blog in the checklist. They’re so ashamed of themselves they didn’t put them in. What a joke the people that make cards now-a-days. Clearly they just decide to put players nobody wants into products to bump up the listed hit totals so they can sell their junk for even more money. So they walk around the shop and see they still have a bunch of scraps of jersey from last years scrubs and still some sticker autos that fell undernieth the copy machine and decide “Ya collectors will want this.” Surprised I haven’t seen a Taj Boyd auto or patch card yet from Panini this year. I think they locked him in a room and wouldn’t let him out till he signed and wore a million stickers and jerseys. WHAT A JOKE. Cody Latimore’s 2014 Panini Playbook rookie patch auto only goes for $.99. 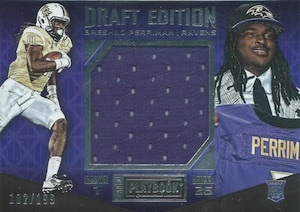 I wonder what this year’s single color patch card of him will fetch because in Panini’s eyes it’s a hit????? Great product!! 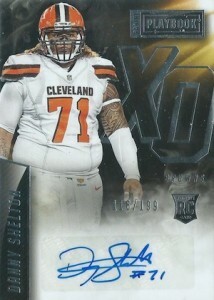 This is a must buy for any card collector! Few Products are sold as “Just A CHANCE” to get what you pay for. 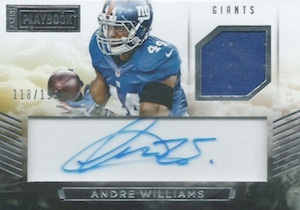 Sports cards is one of those products. On average you may get 1 in about 10 boxes of cards that will give you the worth of the box. A “Legal Gamble”. Yes its a choice whether to buy or not, but yet its a waste of money, cause you will never get a overall positive return on your investment. Just go and buy the individual cards you want in your collection, trying to pull those cards will cost you tremendously more in the long run.